Well Jeff and Joe, I had an opportunity to test a Canadian product called Mouse Free, vicariously, through one of my beta-testers in the field. 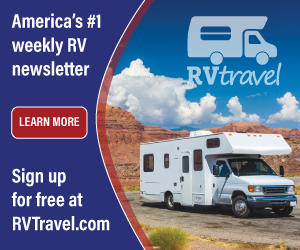 Howard and Linda Payne (rv-dreams.com), agreed to try it out, under my direction, since they were going to store their RV on a farm out in the countryside of KY while traveling overseas. Field mice had been a problem at this location in the past so I thought it would be a great proving site for the test. "We were kind of at a loss of where and how to begin. The instructions you get are very limited. The only written instructions we found were with the spray gun. The instructions said to use no more than 60 psi of pressure. We felt this was not enough pressure to get a good spray of product. At 60 psi, our spray of product was more like spitting the product on. 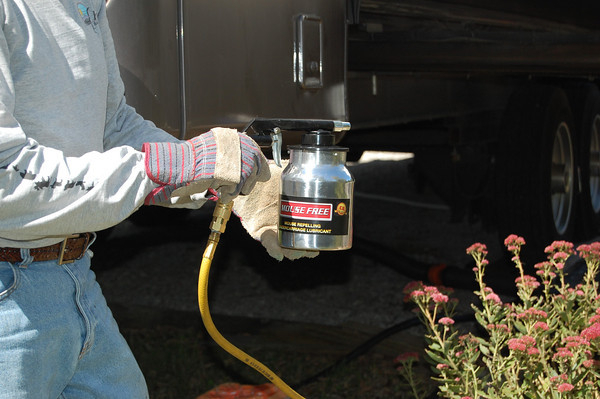 When watching the video of a dealer applying the product, the amount coming out of the spraying was an even coating. Application as a “Do-It-Yourselfer” was difficult because you need an air compressor and getting access to the under carriage. Our RV sits very low to the ground so one has to lay on their back and scoot under and around to apply the product (see photo below). The instructions suggest wearing protective eye gear and we are glad we did. 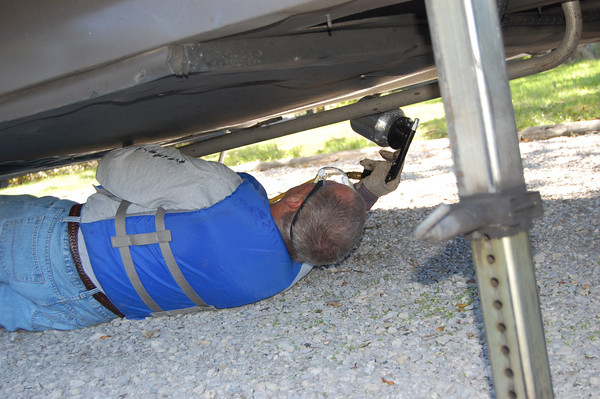 The spray of the product does get on you when you are applying it to the under carriage. The literature states that one gallon coats up to 24’. Our 5th wheel is 39’ and we did not use an entire gallon. We are not sure why, but it could have something to do with the amount of air pressure that the instructions suggested. It was unclear of how much to apply in a given area. Cleanup was suggested as very easy. We did not find this to be the case. 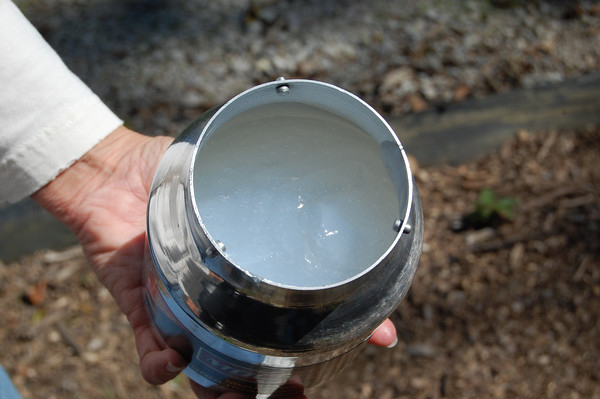 The product is very similar to petroleum jelly and is extremely difficult to clean the spray gun. It was suggested to use hot water and a mild soap. I’m not sure anyone wants this product being washed down into their drains or pipes. I simply gave up and put the spray gun back in the box with product still in it. Although we took other measures to prevent mice, (removed all food, and filled obvious holes with steel wool) we feel the product did work. We parked in the same spot last spring for one week and we got mice (note: we were living in the RV at the time so we had food and we did not plug up holes with steel wool). This time we were gone for a month and there were no signs of mice. In addition, one of the containers had leaked during the shipment to KY and created a mess in the carton. I spoke with the supplier about the leaking container and they assured me this was simply a random accident and that they’ve not had problems shipping the product in the past, but I thought it warranted a mention as a full disclosure of what the Payne’s experienced. As always, your mileage may vary! 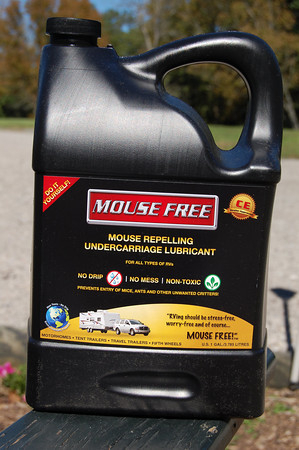 I think the bottom line is that Mouse Free will indeed help keep the critters from entering the RV.